A recent study from Bupa, an international health organization, revealed that 81% of Britons believe their smiles are unattractive in photos, and 28% refuse to smile for photos all together. Similar studies conducted in the United States reveal similar findings, and an even higher percentage of people who feel pressured by celebrity photos to perfect their smiles. While our vanity may influence us to want a perfect smile, what we may not realize is the importance of flossing to maintain our oral health and smile radiance, retain gum tissue and bone density, and remove tooth decay causing bacteria. If you need a superior preventive, family dentist, Westfield, NJ call Dr. David M. Weinman to schedule an appointment today. The expert dental hygienists at our practice can help you learn to love flossing, and keep your smile healthy and beautiful for life. It’s been six months. Your dental hygiene appointment is in two days, and you haven’t flossed since the last checkup. You don’t want yet another lecture about flossing from your hygienist, so you decide to cram six months of flossing into the next two days. The result? Bleeding, irritated, swollen gums, and a profound distain for the entire subject of flossing. You go to your hygiene appointment, and hear the same refrain, “How often do you floss?” Only now, it’s coupled with, “Your gums seem irritated. That could be a sign of gum disease.” That’s it! You think. Flossing is useless. Unlike tooth brushing which makes your mouth look, feel, and taste clean right away, flossing’s early effects can be mostly negative. 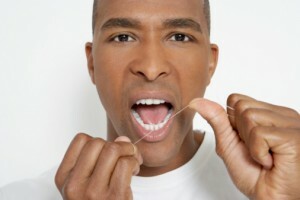 If you don’t floss on a regular basis, your gums will likely become irritated as you remove bacteria that has built up. Many patients report flossing once or twice directly after dental checkups and in the days leading up to their appointment, but rarely flossing at any other time. This inconsistency probably does more harm than good because it leads patients to believe flossing can only be unpleasant. Habit – Just in case you missed it, the most important part of flossing may just be doing it every day even if you’re tired or busy or just don’t want to do it. Floss type – Choosing a floss that you like can help make the task more enjoyable. There are numerous types of floss, but we recommend polytetrafluoroethylene (PTFE) especially for patients new to flossing. PTFE flosses are also called shred free/resistant, and are made from one fiber rather than numerous combined, rope-like fibers in nylon floss. Floss right! – A number of patients who are dedicated enough to floss everyday never learn the proper technique. During your next hygiene appointment, ask our hygienists to show you the best way to floss your teeth. Until then, just remember that the whole point of flossing is to remove bacteria between teeth and between teeth and gums. So, if you’re not flossing all the way under the gum line, you’re not flossing. The easiest way to floss is using the “C” method. Gently glide the using a back and forth movement into the spaces on either side of each tooth in a “C” shape. Doing in this around the front and back of each tooth is extremely effective. We know what you’re thinking right now. That’s it, I’m going to start flossing, and this time I mean it. You may even be in your car on the way to your local pharmacy to stock up on fun flossing equipment. We appreciate the enthusiasm, but encourage you to keep it simple and start slow. Choose a floss you think will be gentle and effective, then set a goal to floss at least 3 or 4 times a week for a month. After the first month, we know your teeth will look and feel better, and you’ll want to change your oral hygiene routine to include daily flossing. If you need a general checkup or want to find out more about flossing, call the office of Dr. Weinman to schedule an appointment today. Our Westfield, NJ office welcomes patients from surrounding areas including Scotch Plains, Fanwood, Cranford, and Mountainside. Comments Off on Flossing is Essential!